I had the idea to start a new series of posts on Saturdays that would be a surprise look at something a bit different. I suppose my daily blog topics have always been rather unpredictable, so it really isn't anything new! I take many photos of things that catch my eye. These are fun to share and can be a great source of inspiration. 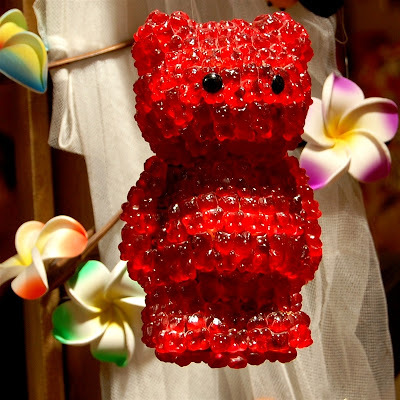 This is a gummy bear made up of gummy bears. 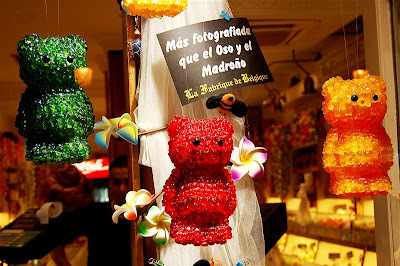 We saw it in a candy shop window in Madrid. When we lived in Germany and England, gummy bears were a popular treat for our boys. I think they are readily available in the US now - back then they were a special treat. I enjoy looking at the shops in other countries. Some seem very similar to the the stores at home while others are quite unique. 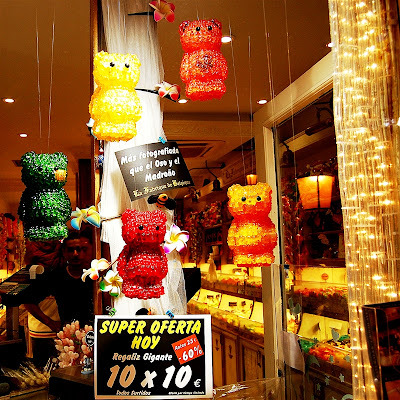 Shop window displays can be a great source of inspiration. I noticed the sign above the bears and translated it (roughly). It says that these bears are photographed more than the Bear and the Strawberry Tree. El Oso y el Madroño (the Bear and the Strawberry Tree) are part of the coat of arms of the City of Madrid. 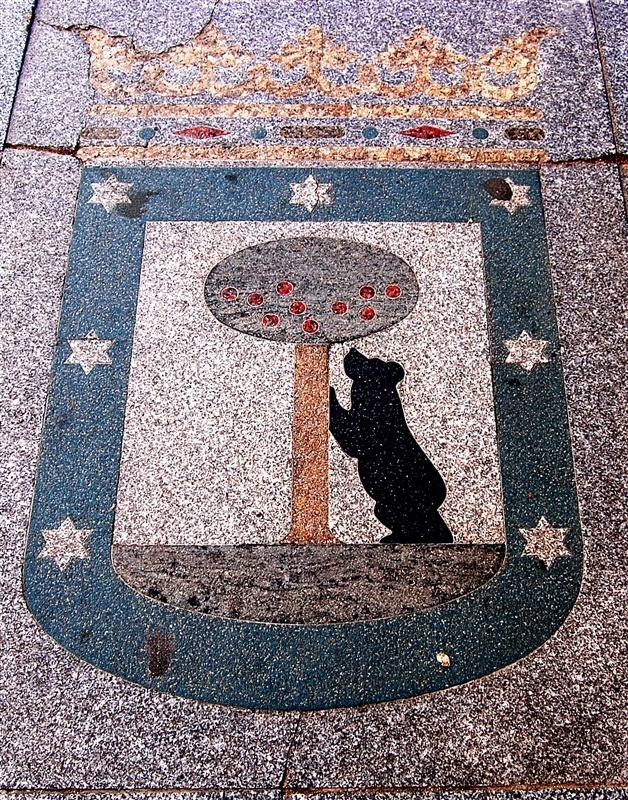 This rendition of the coat of arms was inlaid in the sidewalk. 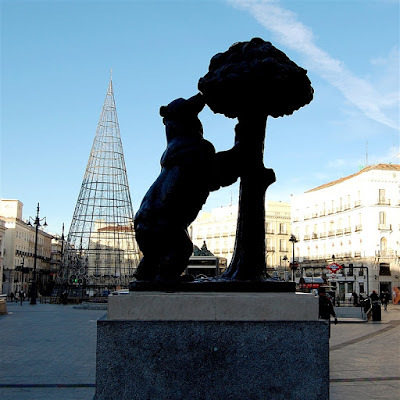 There is a large statue of the Bear and the Strawberry Tree in the Puerta del Sol, in the center of Madrid. In this photo you can also see the huge Christmas tree structure that was beautiful when lit up at night but rather odd looking in the daytime (if you missed the night time photos see THIS POST) . 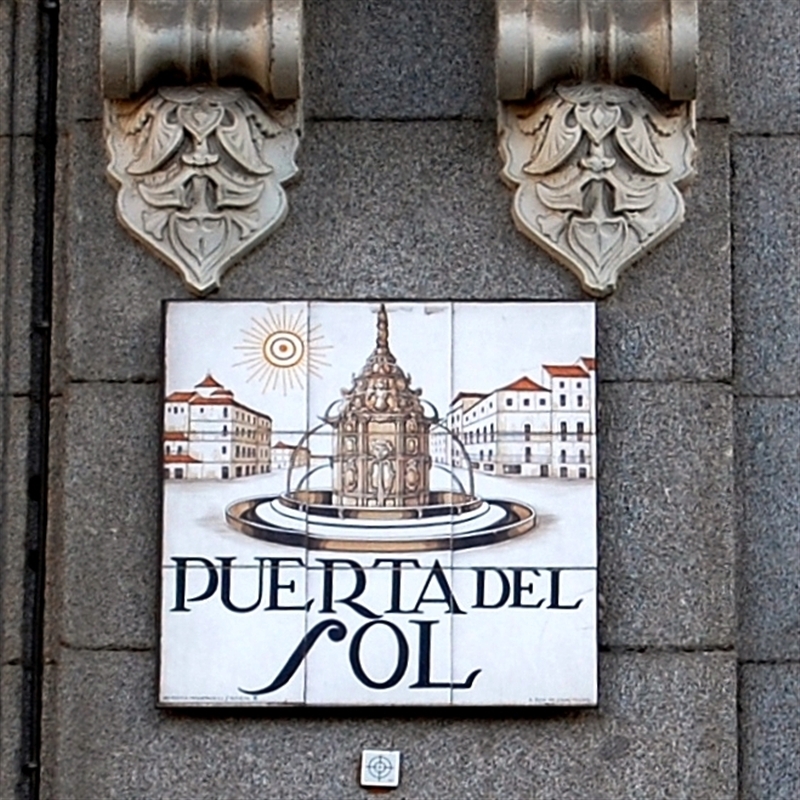 Here is one of the tile signs for the Puerta del Sol - I like to take photos of signs to use as titles for scrapbook pages. The statue of the Bear and the Strawberry Tree was put up in 1967. 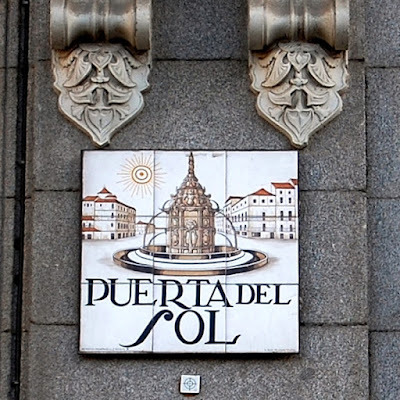 It is about four meters tall and weighs twenty tons (made of stone and bronze). The sign in the store was correct - I did take more photos of the gummy bear bears than I did of the statue! Thanks to everyone who wrote or left a comment about the significance of the girl in the "O" - I realize that I wasn't particularly clear in my writing. I do know what a cameo is - I have several that I wear from time to time. I understand the play on words the company used in naming the larger machine. I was trying to say that using the girly profile with the ponytail protruding from the edge of the circle formed by the "O" was not a choice I would have made. For one thing, I wonder how male crafters feel about the image. Most of the graphics used by the Silhouette company have a streamlined and simple feel and the Barbie profile just looks odd to me. It's not a big deal - they could put flying purple people eaters on the machine and box. As long as the machines continue to work as well as they have so far I really don't care that much what it looks like! like the old fashion hand-made ornaments that our Grams made out of styafoam, sequence/beads, and millions of the tiniest head-pins. Good Morning Diane. I love to see the pictures from your trip, so many beautiful places to see in this world. But I do have a question, is there really such a thing as a strawberry TREE? I've never heard of it, sure would make things easy for picking! LOL! Love seeing things from your travels (afar and at home). We LOVE gummy bears and the gummy bears bears. :o) Have a great Saturday! Great picture. I wonder how difficult it would be to make those bears? It would make a great "Guess the Number" item at school. I really like those Gummy Bears in the shop window. Really catches your eye. 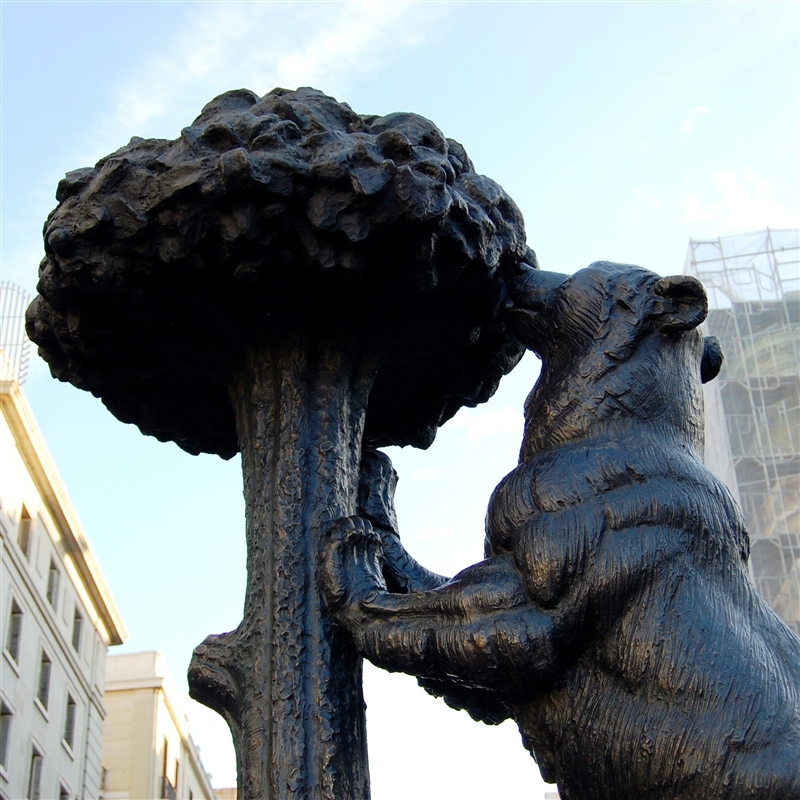 Hummm, a strawberry bear tree. It's a strange city mascot. Hi! I thought about you twice today -- saw Gummy Bears at the grocery store AND at the checkout at Lowe's! Who knew? ?